A graduate from the Lisbon Academy of Fine Arts, Manuel Rosa belongs to a generation of sculptors who redefined Portuguese sculptural practice in the 1980s. 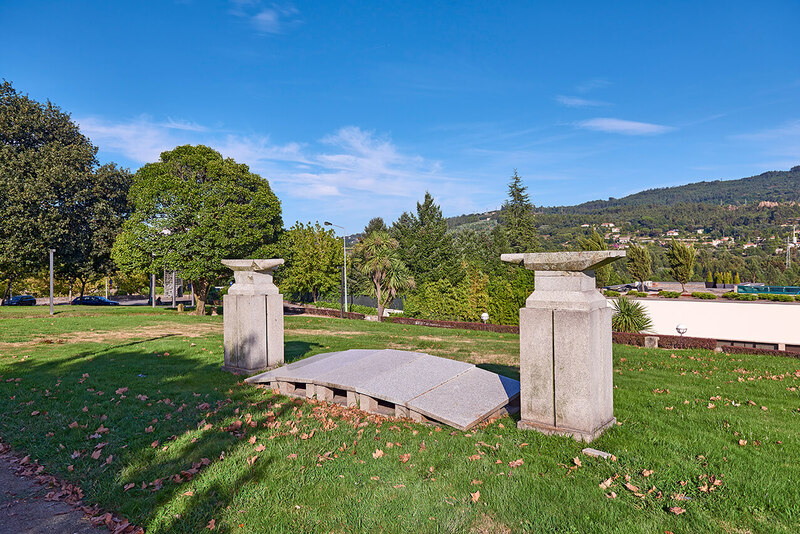 Built in 1991 for the first sculpture symposium, “Arco voltaico” [Voltaic arc] may be found in the garden next to the main building of the Santo Tirso Town Hall. This is a symmetrical stone composition resembling a portico, flanked by two pillars, each supporting an anvil-looking element. Tangential to one of the garden’s borders, the piece foregrounds a previously invisible boundary between the garden and the rural, hilly area of Monte da Assunção. Therefore, the portico is standing there to mark the beginning of something, like a symbolic gateway to another place. Manuel Rosa’s sculpture defines a ramp-like area through which the viewer’s glance is projected beyond the top of the hill towards the sky, as if its unlimited longing for the open space established a relationship with cosmic harmonies. On the other hand, the title’s reference to the electric arc points to a symbolic universe related to science and technology. This phenomenon results from the dielectric breakdown of a gas, which produces a discharge similar to a sustained spark, due to the current through a nonconductive medium, such as air. The arc occurs in a gas-filled space, between two conductive electrodes, and it results in a very high temperature, capable of melting or vaporising most metals. Commercial uses of electric arcs include welding and plasma cutting, as well as arc lamps in movie projectors and follow-spots in stage lighting.